The moose is the largest member of the deer family (Cervidae), and the largest land mammal in New York State. Bulls weigh from 600 to 1,200 pounds and stand up to 6 feet tall at the shoulder. Cows weigh from 500 to 800 pounds. Both sexes have long, grayish-white legs, dark brown or black bodies, and a dangling flap of skin under the throat called a bell. A mature bull’s bell is much larger than those of cows and younger bulls. Cows have light brown faces and a white patch of skin under their tails, while bulls have dark faces and no white patch. Only bulls grow antlers, beginning in March or April. The antlers, which regrow annually, may reach a width of more than 5 feet on mature bulls and are shed from November through January. Moose are one of the largest land mammals in North America. Moose occur in Alaska, Canada and the northern U.S. (from North Dakota to northern New England, and from the northern Rockies south to Utah). Moose can move each ear and each eye independently. 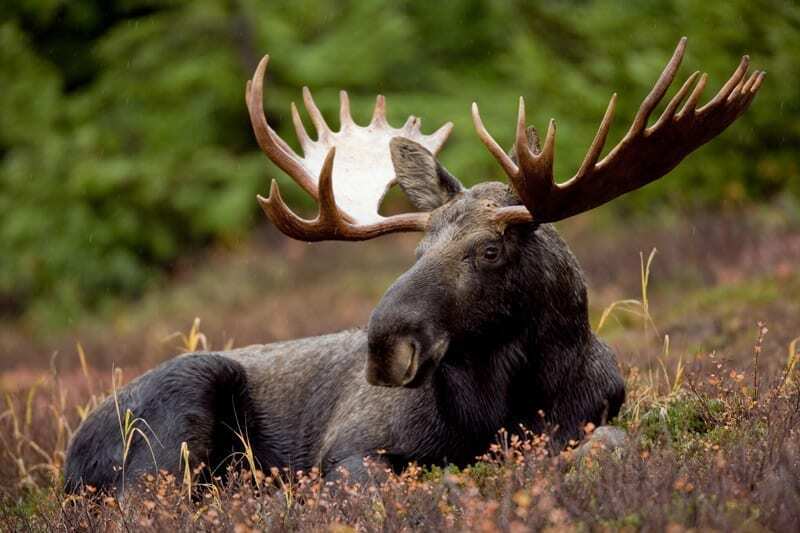 A moose’s home range varies from 5 to 50 square miles. The average life span is 8 years for a cow, 7 years for a bull, though some may live 20 years. Bull moose make several noises, including a loud bellow, as well as croaks and barks during rut. Cows make long quavering moans, ending in cough-like moo-aghs, and a grunt when gathering their young. Moose sleep on the ground, like deer, leaving beds of flattened vegetation, or depressions in the snow. Moose can store over 100 pounds of food in their stomachs.